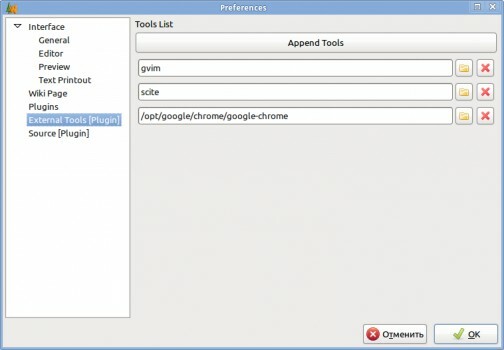 Allows open page text in the external applications. Adds (:exec:) wiki command which in "Preview mode" creates link or button for executing given applications. (Only for OutWiker 1.9.0.768 and above). Below this functions will be descriped. 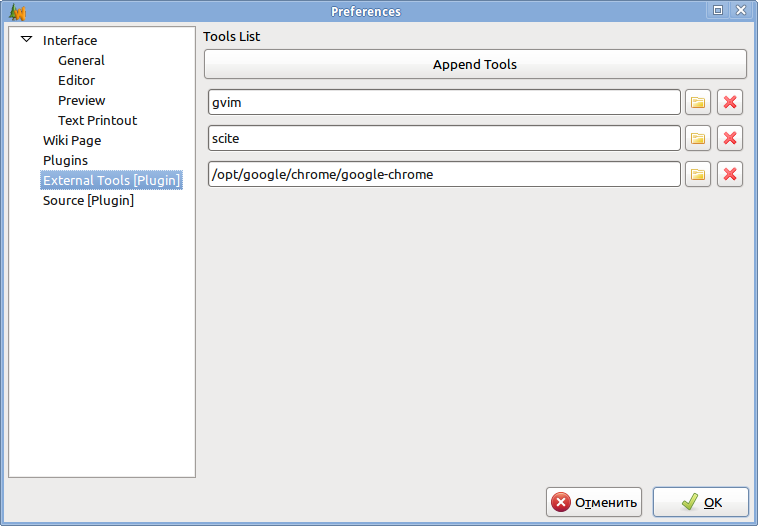 After installing the plugin you need to go out the window settings (menu "Edit - Preferences") and then in the section "External Tools [extension]" to add the programs you want to use in the future. 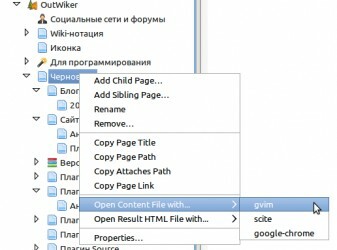 After that, the context menu that appears when you right-click on the article notes in a tree, there will be menu items "Open content file with...", and for HTML- and wikipage will also appear the menu item "Open result HTML file with...". As a submenu will list those applications that you added in the settings. For OutWiker 1.9 and above ExternalTools adds the (:exec:) command for creation link or button for execute external applications from wiki page. (:exec:) command allow to run single or many applications. Every application must writed on the separated lines. If line begins with "#" this line will be ignored. "#" in begin of the line is sign of the comment. format. If the parameter equals "button" command will create a button instead of a link. title. The parameter sets the text for link or button.
. The macros will be replaced by full path to page text file (to __page.text file).
. The macros will be replaced by full path to HTML content file (to __content.html file).
. The macros will be replaced by full path to page folder.
. The macros will be replaced by full path to attach folder without slash on the end. application.exe param1 "c:\myfolder\path to file name"
Added the (:exec:) command for creation of a link or a button to execute application(s).